Rotary broaching, sometimes referred to as wobble broaching, is a fast and easy way to broach an internal hex, square, torx or keyway in a blind hole. Unlike conventional broaching were the broach is pulled through the entire length of the part thus requiring a through hole, rotary broaching allows you to machine polygon forms into a blind hole at the end of a workpiece. This process can be achieved in seconds on any mill, lathe or VMC. Click here for more information on how rotary broaching works. Also check out our Rotary Broaching FAQs page. There are a few things to keep in mind when broaching a blind hole. If possible, you will need to drill slightly deeper than depth of the form you are broaching. This allows room for chip accumulation at the bottom of the blind hole. If feasible, you should also add an undercut so the chips can freely break away. If you cannot pre-drill deeper than your form and you need to broach a flat bottom blind hole there are a couple ways you can achieve this. Polygon Solutions offers an orientation brake that will allow you to orientate the broach in the same starting position each time. With this alignment tool, you can broach half way down the flat bottom blind hole and retract the broach out of the hole. Next, reenter the hole with your pre-drill and remove the chips, then go back in with your aligned broach and broach another half. Keep doing this until you reach your flat bottom. 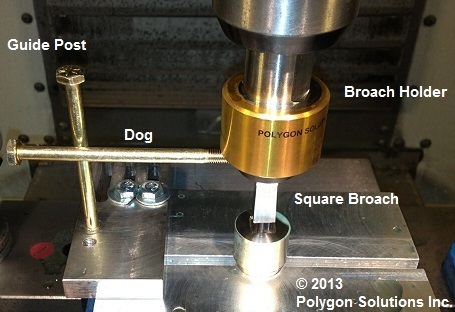 Another way to broach a flat bottom blind hole using a mill is to set-up a dog to align the broach and follow the same instructions above. See the image below. *Adding an undercut to the bottom of your blind hole is recommended if feasible. This process is excellent for machining hex forms into socket cap screws where you are not afforded the latitude to drill deeper. Some of the forms that can be blind hole broached include hex, square, torx, keyways, serrations, involute splines, double d, double hex, double square and other custom forms.